The Rome of Vespasian and Titus comes to life in Davis's entertaining 16th entry in her popular ancient historical series (after 2003's The Accuser) featuring "finder" Marcus Didius Falco. 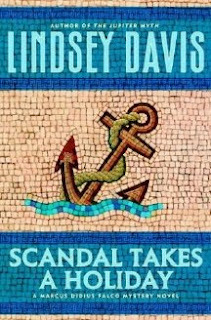 The staff of the official government newspaper retains Falco when Diocles, the paper's gossip columnist, disappears while on a visit to Ostia. At the seaport, a cesspool of corruption, Falco follows up on rumors that pirates, supposedly put out of business by Pompey the Great decades earlier, are engaged in smuggling and a kidnapping racket. Utilizing his street smarts and well-earned cynical view of humanity, Falco moves in and out of dives and places of worship on the trail of a mysterious figure who acts as the middleman between the kidnappers and the victims' families. Disturbingly, some of the clues point to one of the detective's disreputable relatives. Longtime fans will enjoy the additional background on Falco's family, but first-timers, aided by a family tree and an introductory cast of characters, will be able to plunge right in. Well, to be honest, I don't know what to say in this entry that I didn't already say in the last one- shall I reiterate my love of Marcus Didius Falco? Actually, I didn't enjoy this book nearly so much as the previous one; however, I think that has a lot to do with the hours I was putting in at work and my lack of concentration on reading as a result. I don't know if the blame lies with the book, really. We do meet even more of Falco's family in this book (really- his relatives keep popping up all over the place! ), and the character- Falco's errant maternal uncle, Fulvius- seems likely to add an interesting kink to future adventures, if he shows up again. I hope he does- I think he's fun. In general, I prefer the novels wherein Falco and Helena stay in Rome to those in which they travel outside of Rome (mostly because of the large amount of familial interaction in those novels where Falco's at home). However, it is fairly obvious that Falco and Helena enjoy traveling, and that they feel having children and obligations in Rome has really put a damper on their preferred lifestyle. Throughout the book, they both seem quite wistful for the days when they could just pick up and leave and go wherever they wanted, without worrying about other people at all. This is something that often occurs to me when I think about life and "growing up." When a person settles down and has a family (whether planned or unplanned), there are significant- and often unexpected- sacrifices that have to be made. No one ever says that it isn't worth it (possibly because it is very un-PC to say you'd prefer to have never had children or a house in the suburbs? ), but it comes out in so many ways when talking to people. Those older, "wiser" friends that tell you to live it up while you're young- as though these good times somehow come to an abrupt end upon marriage and parenthood and the necessity of putting another person's needs and desires before your own. I think it's very interesting, and very realistic, the way that Davis portrays the Falco household. There are children in it, yes, but they are not the centerpoint of Falco's life. And Helena is there, and probably is the sun in his solar system... but he doesn't give up his way of life for her. He holds very stubbornly to what he feels is his right to go out and make reckless decisions that could have very bad consequences. As though to prove that he is not just a staid family man, but that he is still a rebel at heart. The equivalent, perhaps, of those power-suit-wearing suburban fathers who put racing stripes on their mini-vans? I have read the first couple of books in this series and really enjoy them. I had never heard of this series, but I appreciated your perceptive review. I will have to keep my eyes open for these. Thanks!